Procraftination: It's a Chevron Birthday Challenge! 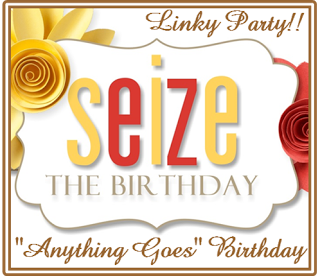 I was so happy to see that our new challenge at Seize The Birthday Challenge has a Toppings option to use CHEVRONS! 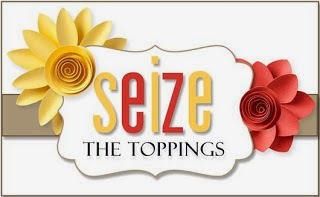 Remember that the Topping is optional, so if you're not in a Toppings mood, the choice is yours! An "Anything Goes" Birthday is just fine. We just hope you'll play along! There are so many directions to go, using chevrons. So I looked to Pinterest for a few ideas...looking for something a little out of the ordinary. THIS fascinating iPhone case was the photo that kept pulling my back. Go ahead. Click over and take a look. Just promise you'll come right back! Here's my take on a fun chevron birthday card. Sponging and stamping! I'm very pleased with the final results. But, I have to admit...this card took sooooo long to create. I had sponged the panel and started to create chevrons with a handmade stencil. Well, I'll spare you the details. But, that homemade stencil was NOT the way to go! I sponged a new panel and started over, using this distressed chevron stamp from Close To My Heart. Much better results. Trust me! I hope you'll join me and my super-talented team mates at Seize The Birthday for this chevron "Toppings" challenge. I can't wait to see what you create! I love your inspiration for this card. Isn't Pinterest great! I'm there more than I need to be. I love the beautiful colors on your card and, of course, those great chevrons! Beautiful card Susie. I love your sponged colors with the stamped chevrons. Very creative. Ahhh, what a beauty, Susie! Love all the chevrons and the pretty colors! Have a great weekend, hugs! I love the sponging of those bright and cheery colours. Looks great with all those chevrons! Sounds like a lot of effort and re-dos went into this card....but it was worth it! It's wonderful!!! Beautiful card, Susie! Love the colors and sponging! This came out amazing! I love it! Such a striking card! Love the colourful background. Fabulous!